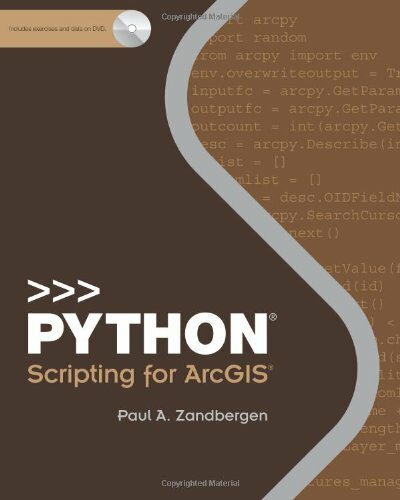 Python Scripting for ArcGIS is a guide to help experienced users of ArcGIS® for Desktop get started with Python® scripting. This book teaches how to write Python code that works with spatial data to automate geoprocessing tasks in ArcGIS. Readers can thus learn the skill set needed to create custom tools. The book contains 14 chapters, with the corresponding data and exercises on the accompanying DVD. A 180-day trial of ArcGIS 10.1 for Desktop software is also provided as an online download. More details on the book can be found at the Esri Press website: esriurl.com/5564. This includes sample chapters for download. Instructor who are considering the book as a textbook for a course can request a deskcopy from Esri Press: esripress.esri.com/offers/deskcopy.